In addition to the weather, Tim and I love to talk about bike parking, bike racks and anything related to parking and racks. If you ride a bike, you need to have a secure parking spot for it upon arrival at your destination. SDOT wants to know where on-street bike parking is needed around the city. So go ahead and send them your suggestions! 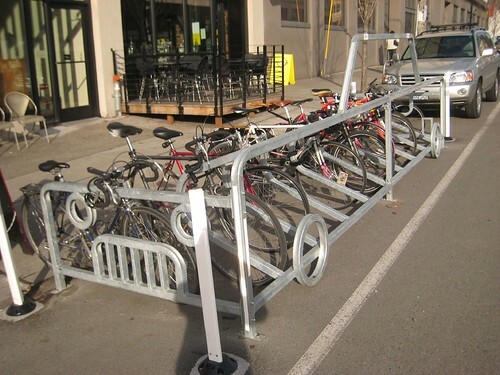 Email requests to bikeracks@seattle.gov. I already commented, telling SDOT to expect some from me. But unless you only want them in front of cafes, bars and restaurants (when I ride a bike, I get hungry, thirsty and I need a place to park my bike!) you better submit your spots, too. This entry was posted in alternative transportation, bikes, Rack that Bike, seattle and tagged bike parking, bike racks, on-street bike parking, seattle. Bookmark the permalink. Nice. I’ve never seen an on-street bike corral in Chicago.